This is the initial chart that I see when I look at $LTC #Litecoin. It’s looking very bearish to say the least, but when we examine recent price movement over the last 48 hours and compare it to the rest of the crypto market, $LTC has been getting throttled quite that hard. What I’m doing here with Tether is a little bit different than the convention, I’ll admit. 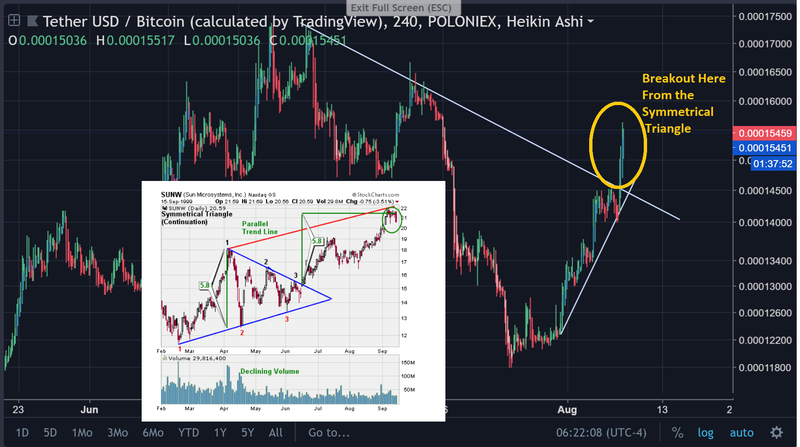 Rather than looking at the BTC/USDT pair, this is a look at the USDT/BTC pairing (thanks TradingView). 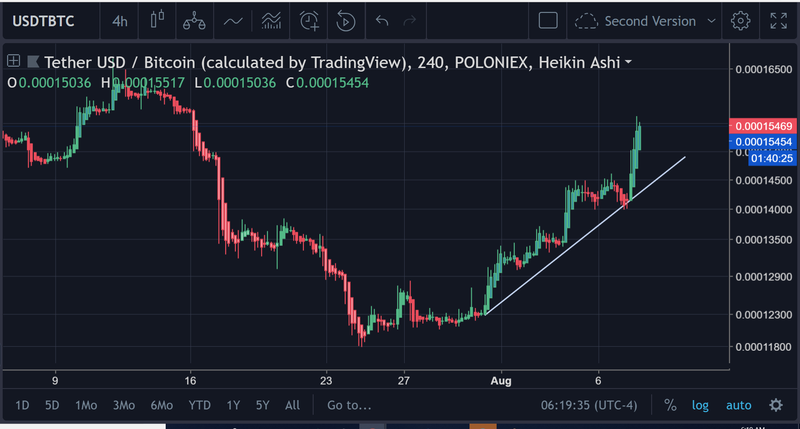 Even with the first chart it becomes readily apparent that the price of USDT is on a major uptrend on the 4H chart — the likes of which it has not seen in some time. No clearer of an outbreak than that. Perhaps the only saving grace here is the fact that the volume on the breakout wasn’t particularly tremendous. 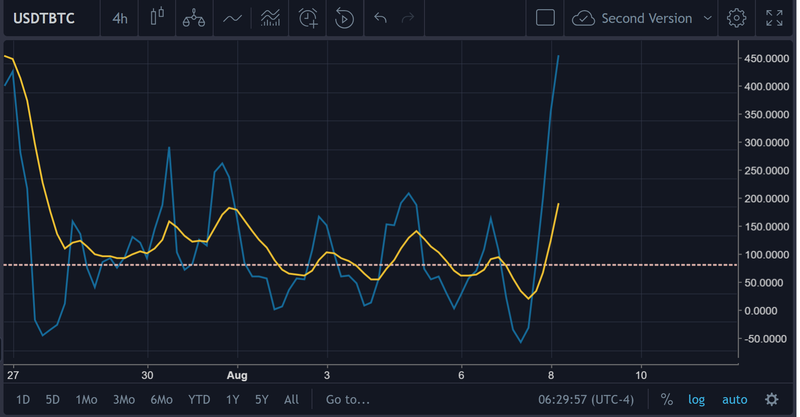 As you probably expected, its grossly overbought at this point, although it looks like the momentum is starting to wane slightly. 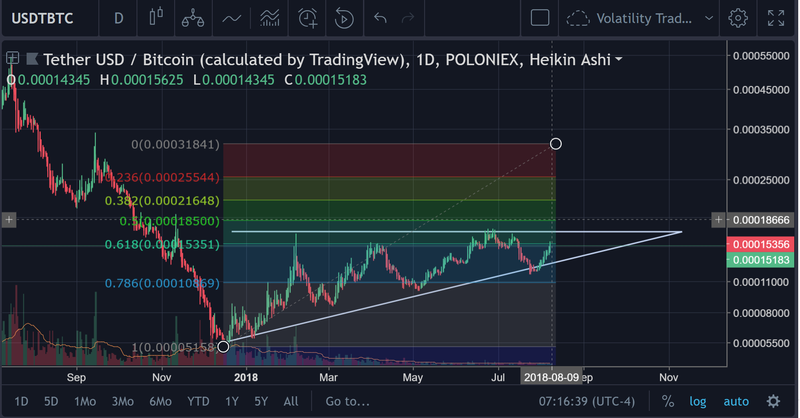 Keep in mind this is still the 4H chart that we’re looking at for the USDT/BTC pairing here. What you see in this picture is the Rate of Change(5) of the RSI(14). The purpose of this indicator is to detect early symptoms of some sort of waning in the momentum of the RSI(14) before there is visible divergence on the price chart. At times this is an effective indicator, and in other times this is something that simply can’t gauge the micro-movements in the market or is something that is not sufficient, in itself. However, in this case, it appears that what we are seeing is pretty unambiguous as far as ‘signals’ go. The Rate of Change on the RSI(14) is still rocketing straight upward into the air. The best move to make from this point would be to size down to a lower time frame. Because it will help us see if there is any potential retraction in the appreciation of USDT against $BTC. Symptom #1 of weakness. The candles are getting smaller up here, and the run is beginning to wane. 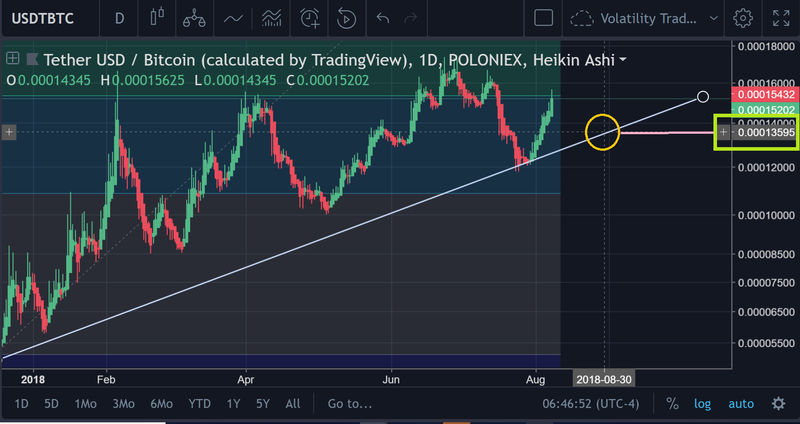 Well, it definitely does not mean that we are on the precipice of a complete reversal in the price, but it would not be out of question for the price to test that uptrend line once again. This scenario depicted above is definitely a latent possibility. Seems that there is strong overhead resistance here based on the previous quasi-H&S pattern that formed former late June/early July. 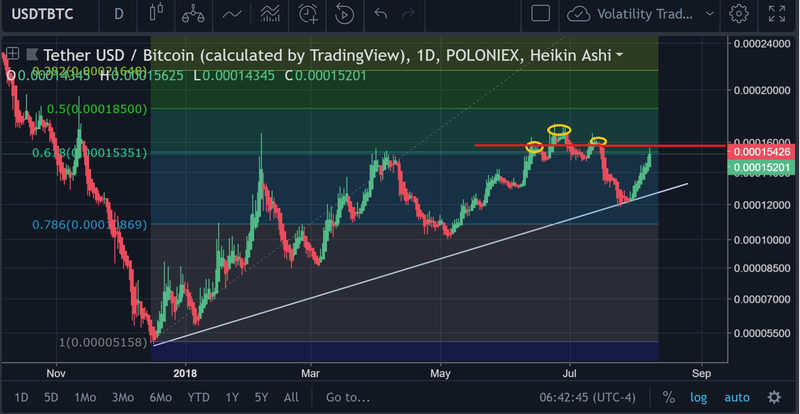 That resistance zone is hanging right around 15.4k sats/dollar. Not to mention the 61.8% retracement level for the Fib is hanging right above where the price is currently as well. The lime green square boxes on the chart above mark all of the times that the price has failed to really definitively make it up over the hump to break that 61.8% retracement level. However, that does not mean that it can never happen. 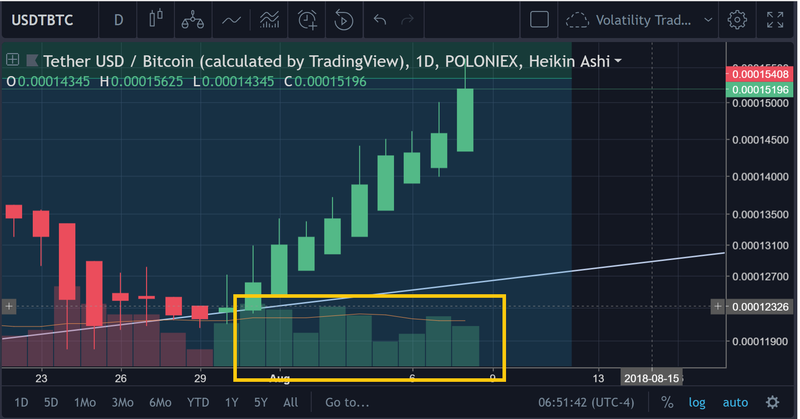 But all signs seem to indicate that this will not happen and that there may be a slight bounce before the price continues. 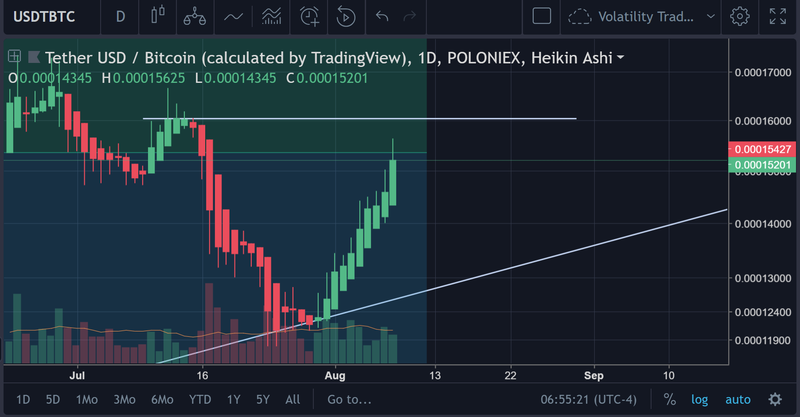 One thing that cannot be ignored is the fact that the uptrend in the USDT/BTC pairing appears to be holding solid. 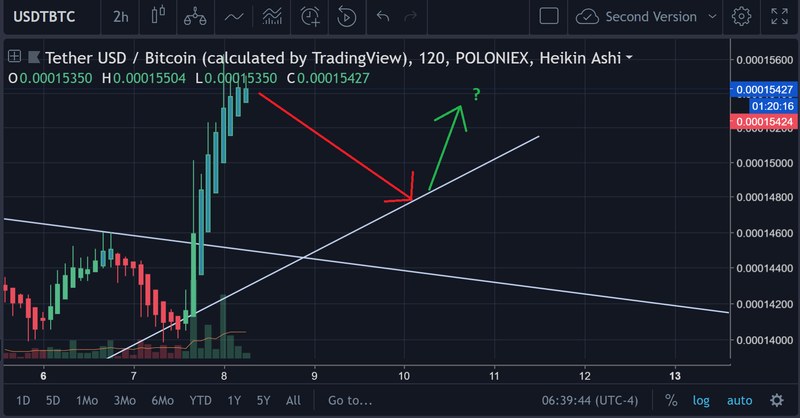 Next stop on the uptrend line (if it does touch again), would be right around the 13.5k sat range. Slightly descending volume for $BTC here. Common sense would state that there is going to be another rejection here. 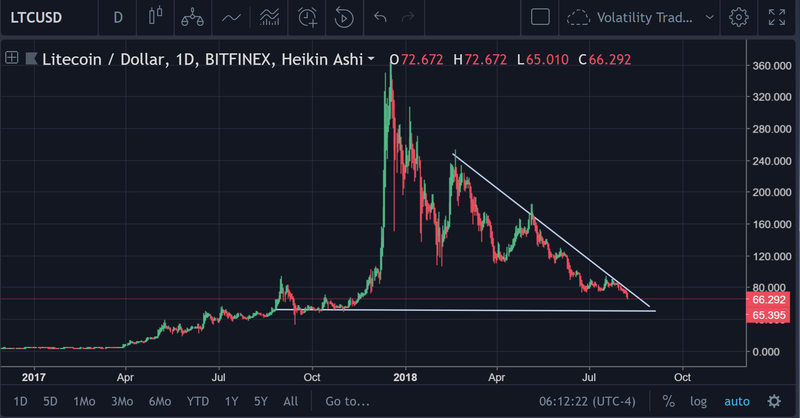 IT just doesn’t appear that there is enough momentum left in the run to sustain a break through the resistance levels that are directly overhead on the USDT/BTC pairing. This is bad news for $BTC bears (shorters) of course, and perhaps some consoling news for bulls that got destroyed in the markets recently. 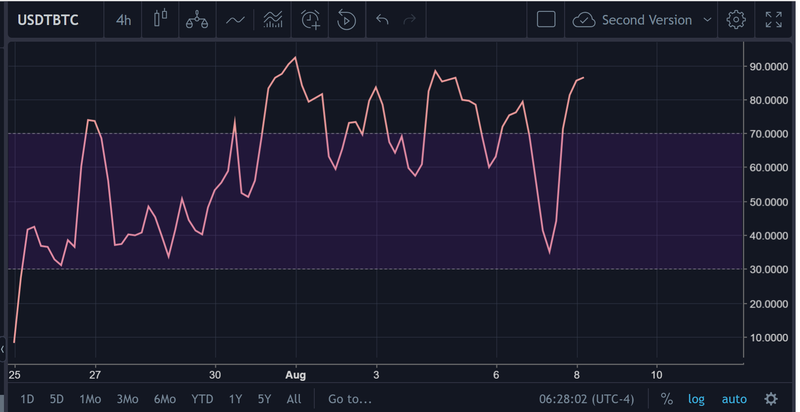 In either case, a ‘long position’ is not quite “safe”, but it is definitely a lot safer than what it was just a few days ago when the price was hovering around $8k. So, do the math on this yourself. If you want to figure out what this means in terms of $BTC value, you do 1 (the number one) divided by (/) the sat value of USDT (one dollar). Right now, the sat price of USDT = 15403 sats. If you placed the full amount in that investment, you’d have 6,493 units of Tether. So, if the price of Tether went to 16k sats, you’d have 1.03 Bitcoin (approximately) for example. Which makes a short position here a little less rational, all things considered. However, there is a major pattern that traders should be watching for here, which is the flat top triangle. 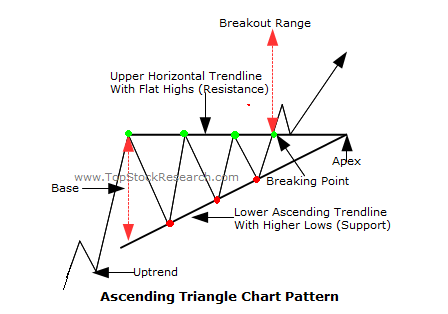 This is part of the ascending triangle family of bullish breakouts. 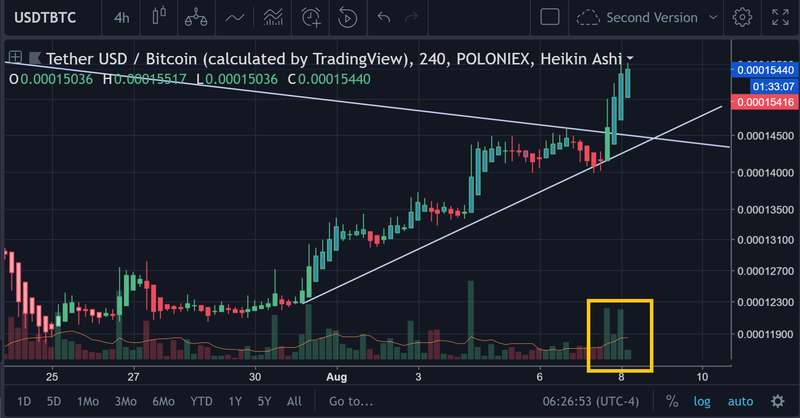 There’s a chance that there’s another bounce against the top of this triangle like what we have observed with earlier challenges on the upward trend of $USDT, however, expecting such a thing to happen, would be a fool’s pursuit. It does appear though that the appreciation of USDT against $BTC is starting to wane a bit though (in the short-term), so it may not break on this attempt here. 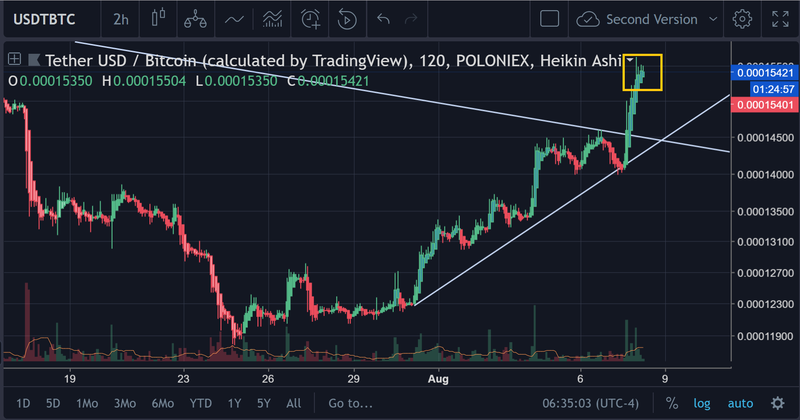 If and when the price does break north of the flat top triangle formation, 18.5–19k sats/Tether is a more than reasonable expectation. That would be a $5.4k ish Bitcoin. 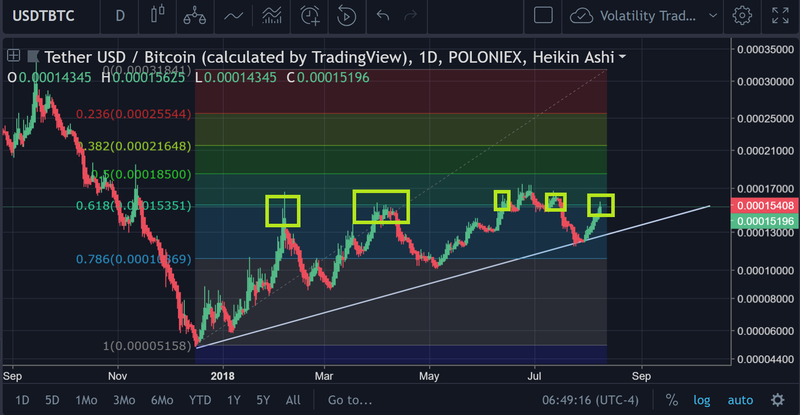 Obviously, given the information that has been unearthed here in this price analysis, it would be very much in one’s interest to have been accumulating as much Tether token as possible over the course of this bear market. When juxtaposing this fact with the idea that billions of dollars worth of Tether token have been printed this year, it makes one question whether the strategy all along hasn’t been to simply accumulate as much Tether token as possible and then ‘sell’ those Tether tokens in the future in order to gain a leg up.